After 30 years of effort, LR Baggs has created the Anthem Tru-Mic acoustic guitar microphone which does what every amplified acoustic guitarist has dreamed about and no other pickup manufacturer has been able to create yet-unlocked the potential of a microphone to capture the very essence of your guitar with high-feedback resistance for demanding stages. Not obvious, but equally important, is that the natural ease and dynamics of the Anthem Tru-Mic guitar microphone liberates you to play freely without having to compensate for the pickup system. Now you're free to play the way you like, plugged in or not. For the Anthem acoustic guitar mic, LR Baggs used no modeling or illusions. It's not "like" a mic. It's not "like" your guitar. This is a mic, and what you will experience is your guitar-loud and with the fidelity and dynamics that come from a real microphone. 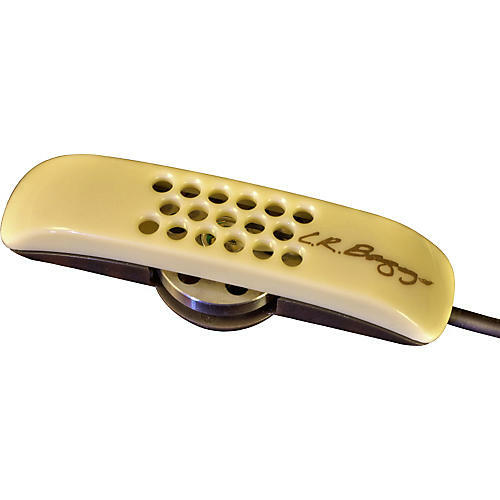 At the heart of the LR Baggs Anthem guitar mic is a revolutionary type of microphone. Using a proprietary noise-canceling mic, the Anthem Tru-Mic eliminates any annoying honky or boxy qualities that have been previously associated with internal miking, leaving the pure and natural sound of your guitar the way only a real mic is capable of doing. Because this LR Baggs acoustic mic is positioned within a few millimeters of the guitar top, it has very high gain before feedback. The mic housing mounts easily to the bridge plate and the mic capsule hovers just 3mm above its surface to take advantage of the PZM or boundary effect. This Tru-Mic technology picks up the sound of the vibrations of the entire soundboard and makes the LR Baggs guitar mic unusually free from placement issues. The sound quality and feedback resistance of the Anthem Tru-Mic acoustic microphone now allows the mic to be the primary sound source in a mic/pickup system. This is unlike previous systems where only a small amount of the mic could be used to add some air to the dominant pickup signal. This is a radical new relationship between a mic and a pickup, as all of the detail, warmth, and personality of your guitar is captured by the Tru-mic. The mic is augmented, for only the very lowest frequencies, capturing the punch and authority of your playing, by the LR Baggs Element under saddle pickup. The featherweight control unit controls all of the essentials, volume, mix, and phase. It nestles securely just inside of the soundhole for easy fingertip access. The mix control allows a full-blend between the augmented mic and full-range pickup. A multi-segment battery check allows you to maximize battery life and peace of mind. Under the hood is an all-discrete preamp/mixer with the pure, clean LR Baggs signature sound that is trusted by top artists around the world. Thanks to it's intelligent engineering, you can just plug in and enjoy the real sound of your acoustic guitar and the way you play, night after night. Tru Mic dimensions: 2.27" x .735"x .48"